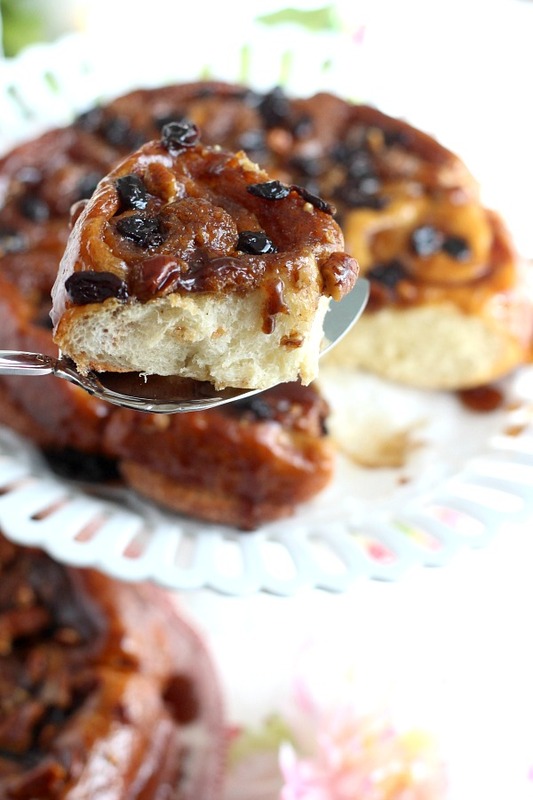 Who can resist soft, sweet sticky buns? 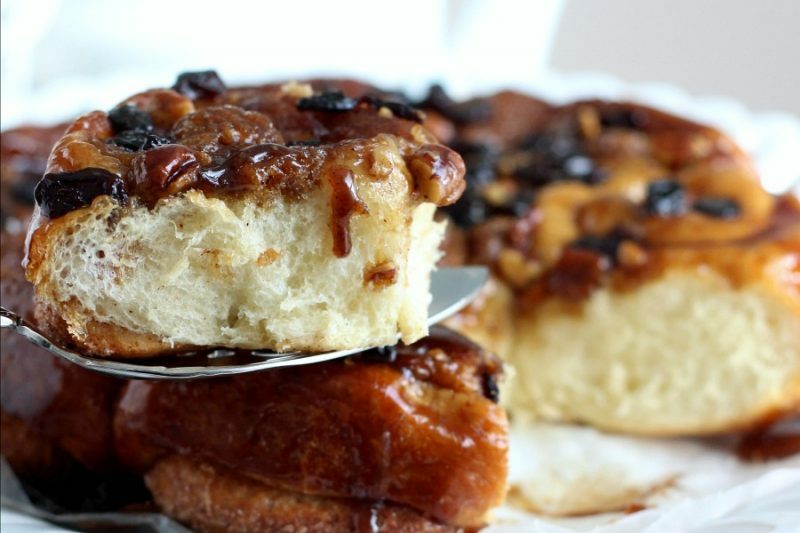 You are sure to receive smiles and maybe hugs when you serve up swirls of tender yeast bread filled with cinnamon and topped with nuts and raisins with a sweet caramelized topping. 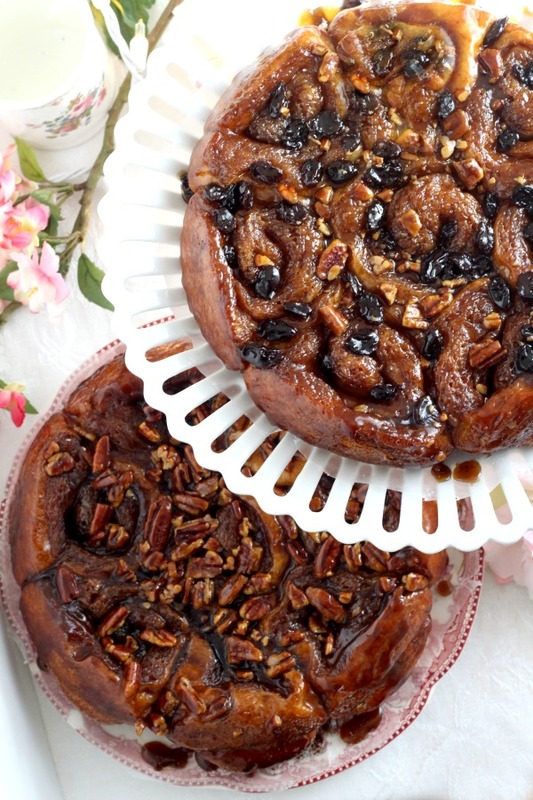 Make Pecan Sticky Buns easily using a bread machine for the dough. And then, wait patiently as the house fills with an amazing aroma. Savor warm from the oven. How do YOU eat a sticky bun? 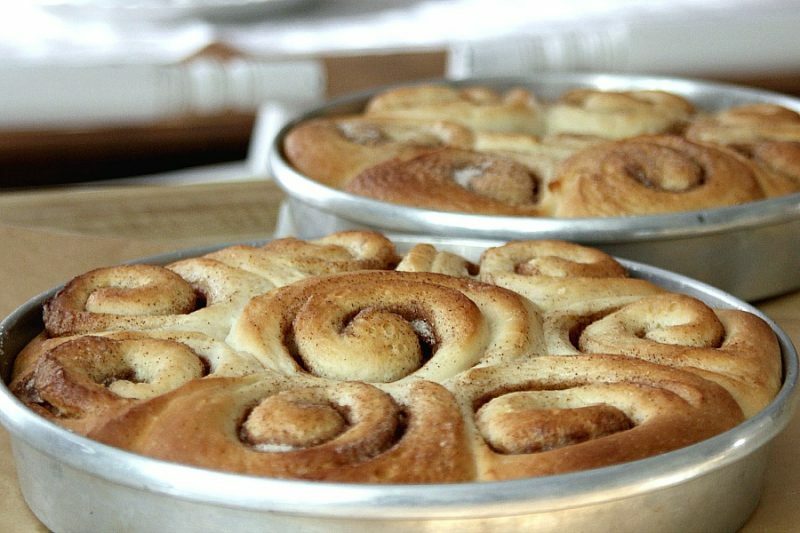 Whether you call them sticky buns or cinnamon rolls, you probably have a technique to eating them. The non-messy type person probably uses a knife and fork and cuts dainty bites to savor along with tea in a pretty China cup. The practical type might forgo the pageantry and simply take a bite and enjoy its delicious taste with their mug of black coffee. Then there is the enjoy-the-experience type who slowly unrolls the gooey bun, tearing off pieces as they take it to their mouth letting it melt therein. 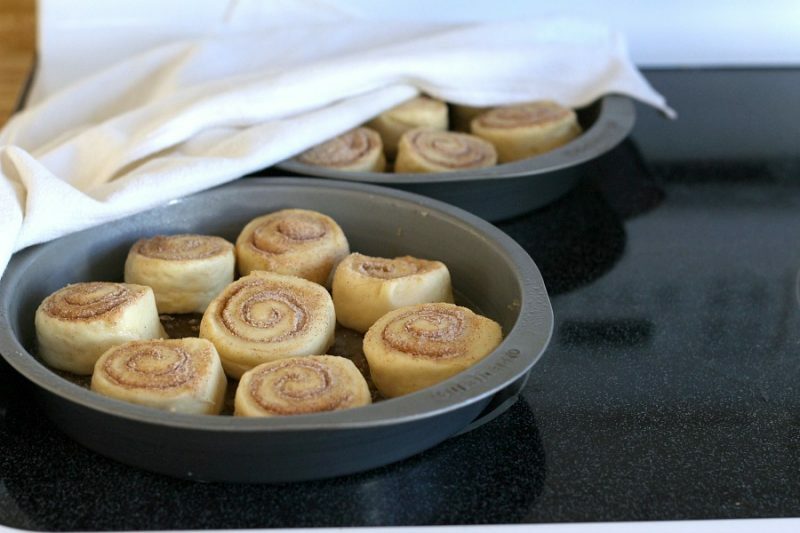 There’s nothing better than a home-baked cinnamon bun. It is warm, gooey, and fingerlickingly good! This recipe makes two round pans with 8 buns in each. Top the sticky buns however you please. I topped half with pecans and the other half had both pecans and raisins. You can omit either/both if you wish or substitute walnuts for the pecans. My ages old bread machine just keeps on going. It makes the best dough with very little effort. I think it has lasted so long because I rarely bake in it. I make dough and shape it into rolls, braided bread, pizza or other yeast treats and then bake in the oven. 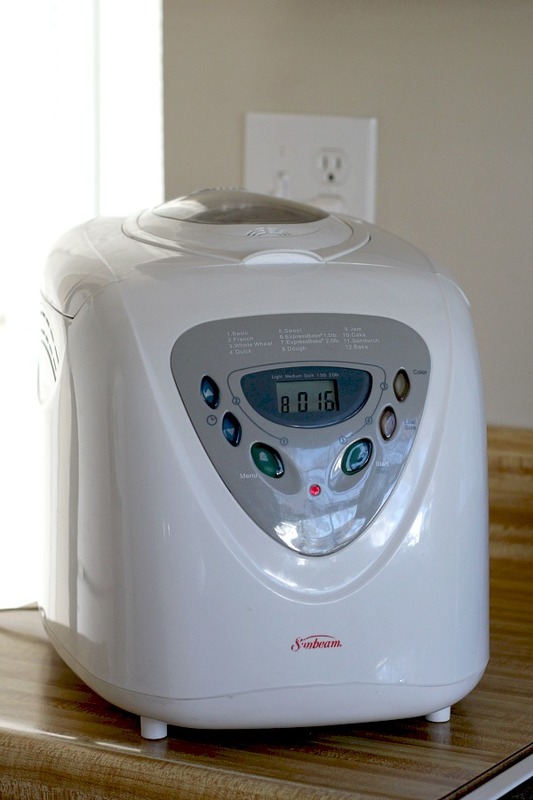 You certainly can bake in the bread machine and it is so convenient, but I still prefer to use the oven. After the cycle is complete, this is the lovely dough that is produced. After combining the glaze ingredients, pour into prepared pans. Sprinkle on the brown sugar and nut mixture. Set aside. 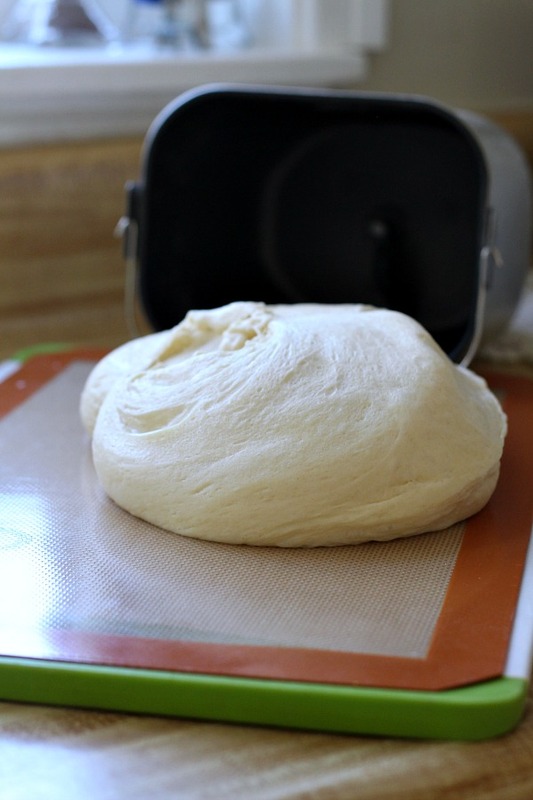 Roll out the dough into a 16″ x 12″ rectangle. 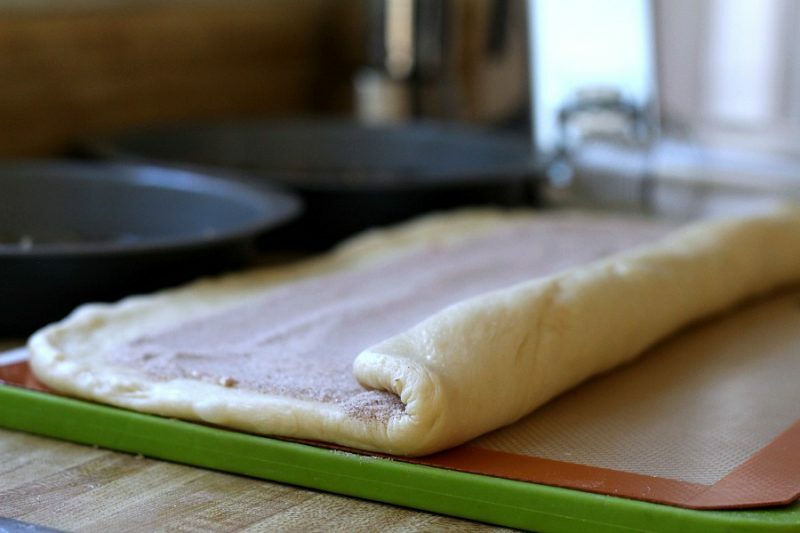 I like to roll on a silicone mat because it doesn’t stick and I don’t need to add additional flour. Sprinkle on the cinnamon sugar mixture to within 1-inch of the long end of the rectangle. 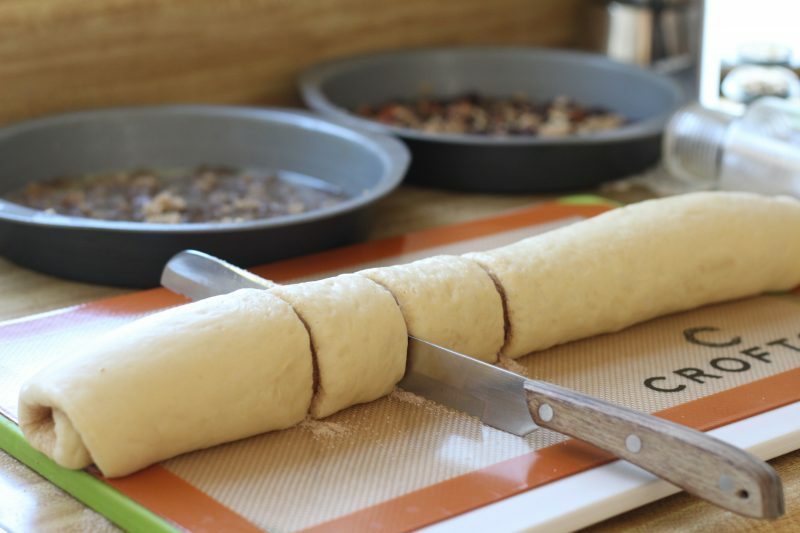 Roll the dough into a log and pinch edge. Using a serrated knife, slice the log into 16 pieces. Use care so you don’t cut into the silicon mat. Space eight buns in each of the prepared pans. Cover the pans; place in a warm, draft-free place and let rise until they spread out and touch one another, about 60 to 90 minutes. While the buns are rising, preheat the oven to 350°F. Bake the sticky buns for 15 minutes. Tent them lightly with foil, bake until golden brown, about 10 more minutes. 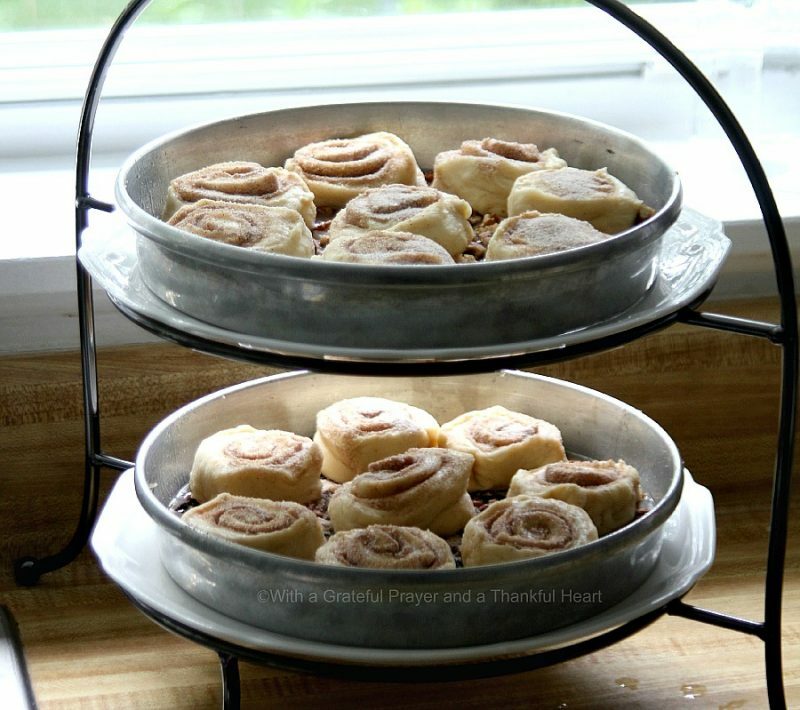 Turn the baked buns onto parchment paper or cooing rack. Yum! They are as delicious as they look! Call in the gang, if their noses didn’t already bring them, to enjoy warm, gooey, sweet and scrumptious pecan stick buns. Set the machine to dough setting. Push start. After just a couple of minutes, I like to peek in and, using a spatula, scrape down any ingredients on the side of the pan. This probably isn’t necessary but I do it anyway. When the cycle is complete, remove dough from machine and allow to rest, covered for 5 minutes. 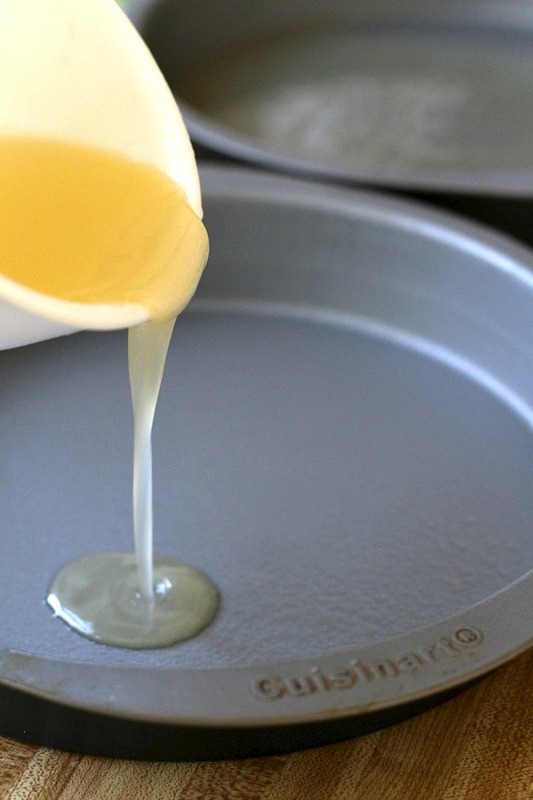 When dough is finished, lightly grease two 9″ round cake pans. Divide the glaze evenly between the pans. 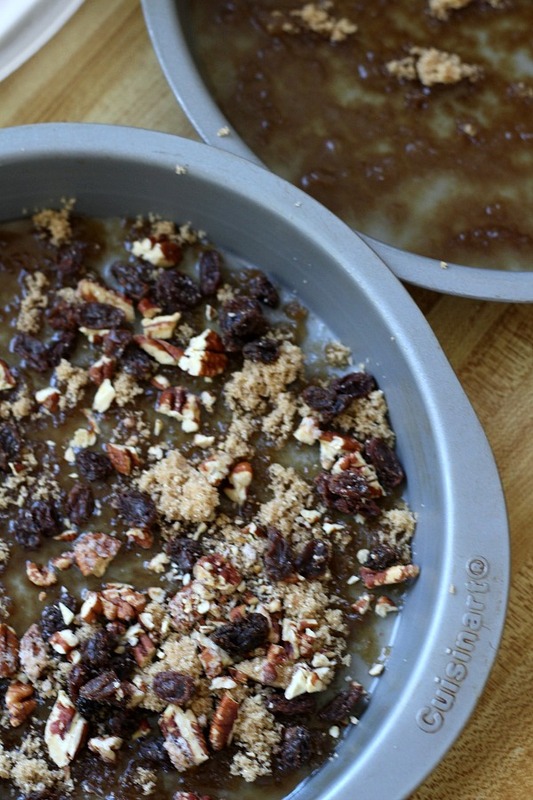 Sprinkle with brown sugar and pecans (and raisins, if using). Sprinkle cinnamon sugar mixture evenly over dough, leaving an uncovered strip about 1″ wide along one long end of the rectangle. 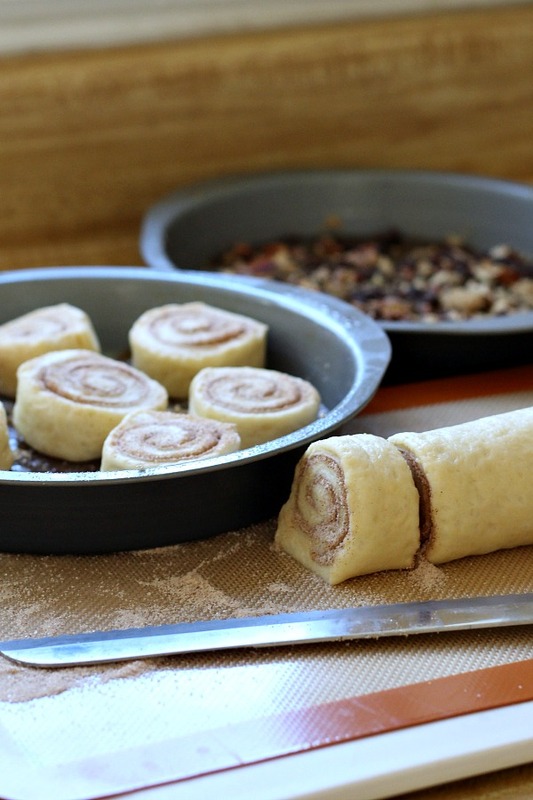 Starting with the sugar-covered edge, roll the dough into a log the long way. Using a serrated knife, slice the log into 16 slices. Space eight buns in each of the prepared pans. Cover the pans, let rise till they spread out and touch one another, about 60 to 90 minutes. Bake the sticky buns for 15 minutes. Tent them lightly with foil, bake till light golden brown, about 10 more minutes. After rolls have cooled, separate and place into a freezer container lined with waxed paper. Thaw on half power about 20-30 seconds. These look wonderful, and easy because of the bread machine! I'm wondering if I can get these all formed and put in the pan and bake them the next morning? Would they just need to go in the fridge? Would they need to rise a bit before I put them in the oven? Your sticky buns look absolutely wonderful! After working outside, there isn't a lot that would induce me to bake inside, but these would do it. I already pinned this but had to come visit the post…looks toooooooooo good!! Oh, my goodness, these look like something out of a magazine! I'm sure impressed! Sweetest blessings! All I can say right now, while sitting here with my cup of steaming coffee, is that I wish I lived right beside you!!! What is a girl to do, when one sees such amazing creations right in front of her, so early in the morning! You make me smile. You are so fit and trim, and yet you pull things like these rolls from your oven. I guess it is the three weeks of yard work before it all. These look fantastic! They turned out so beautifully. I think it is working too hard – when I exercise too hard I start craving baked goods – sounds like you do too! Bring some over next time! Yum-a-licious. Oh, my word….yum, yum, yum!!! Reminds me of what my Mamaw made and called "stickies"!!! This would have been good with my morning coffee! Your sticky buns look amazing. They are my husband's favorite. I can remember my dad bringing them home from the bakery when I was a kid. I have not seen them sold in stores here in Georgia though. Maybe it's an up north thing! buns! thank you for the recipe. I don't have a bread machine, but those look delicious. I have been playing around with roasted pecan recipes lately. Looks great dear Lorraine.. I love the way you've photographed each step:) Have a great day!